BKA – ‘DYMiN’. From this fundraiser, a donation check in the amount of $1,090.00 US dollars was presented to the CEO, Dellone Pascascio at an interview on Love FM TV, in Belize. This donation supplemented the cost to pay for 2 cancer patients’ chemotherapy treatments. 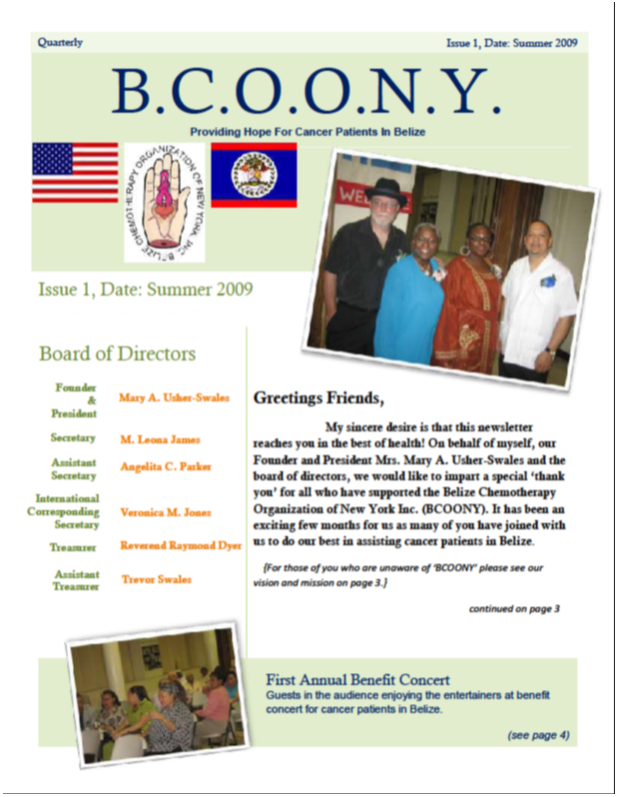 In 2010, due to the effects of the economic downturn, BCOONY was still able to send a donation of $550.00 USD to BCC/D. This donation was able to supplement the cost for one patient’s chemotherapy treatments. needed equipments to ease the burden of manual workload. With great concern, BCOONY’S president brought the request to the Board and a unanimous vote was cast to fill the demand. BCOONY donated one large capacity network computer, one 47” flat screen Monitor TV with video consultation, and one all-in-one color printer. It was a struggle to raise the funds, but we did it with the help of two special persons who wished for their names to be confidential. With respect, their wish was granted by the Board. An all-in-one color printer and a check for $500.00 US dollars totaling $2,500.00 US Dollars were presented to the CEO, Dellone Pascascio. 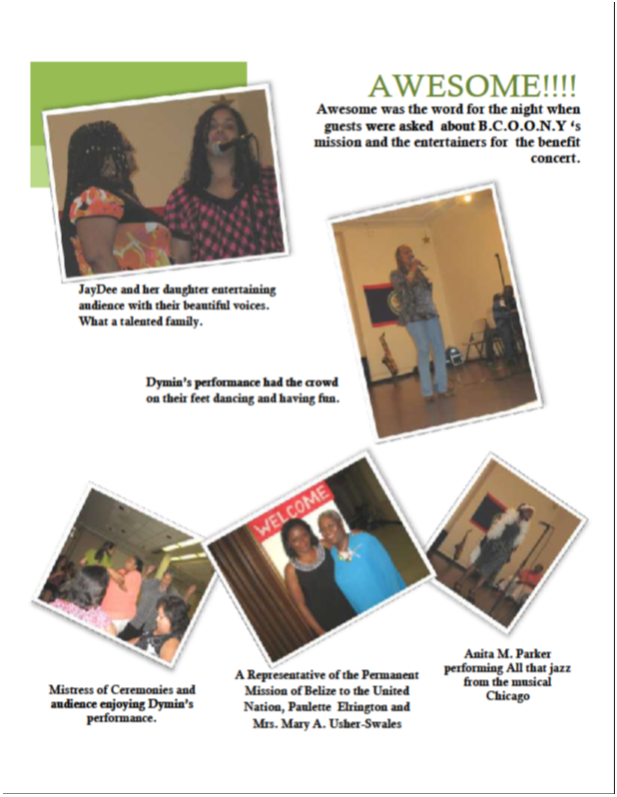 In 2012, BCOONY’s president, Mrs. Mary A. Usher-Swales travelled to Belize to present a donation Check to BCC/D CEO, Dellone Pascascio for payment towards two Cancer patient’s chemotherapy treatments. The amount was for $1,922.00 USD. 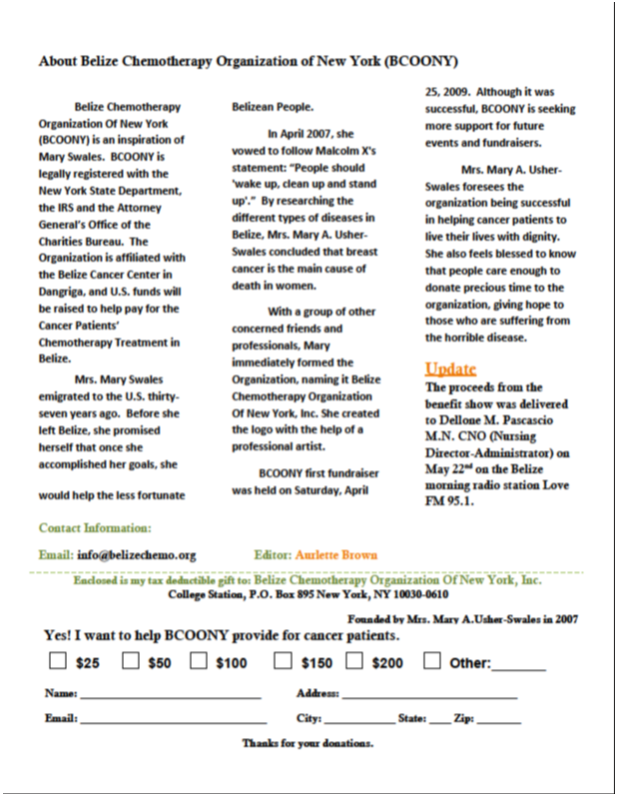 In 2013, BCOONY held its end of the year Fundraiser. BCOONY’s president travelled to Belize to present a check in the amount of $2,100.00 USD to Ms. Dellone Pascascio. 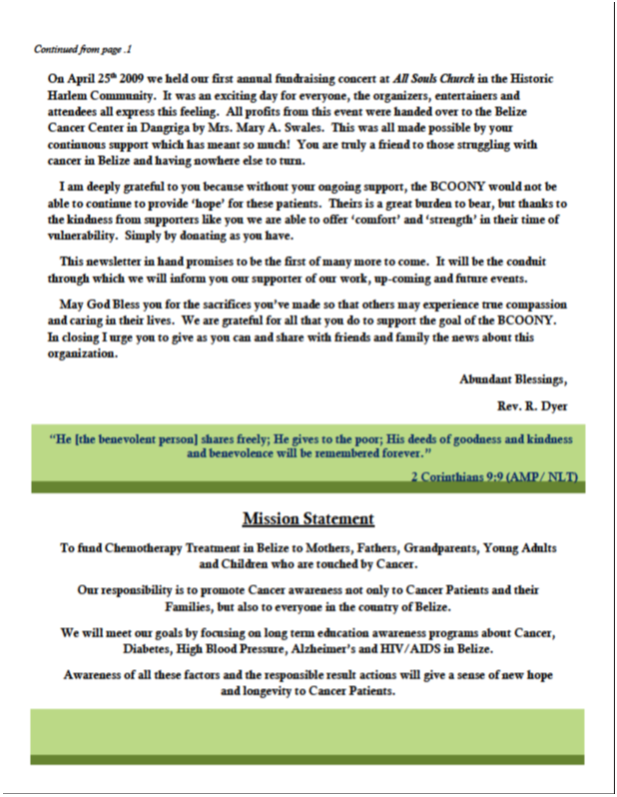 With the request of BCC/D CEO, BCOONY’s president gave an executive authorization to use the donation to save the life of a child who had to travel outside Belize for a special emergency surgery and treatments which was successful. In 2014, BCOONY’s board voted unanimously to cater to the children in Belize who are suffering from cancer, because we believe that they need a second chance in life. Donation of $350.00 was sent to pay for a child round trip travel expenses for treatment outside Belize. 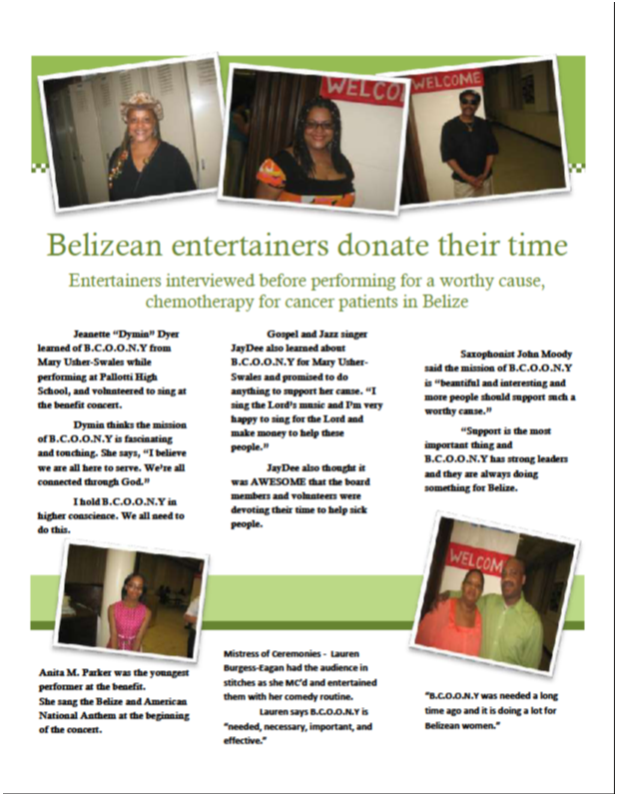 In 2015, donation of $375.00 was sent to the Belize Women Wellness Foundation to supplement the cost for chemotherapy treatment to an adult who is suffering from breast cancer. In January of 2016, another donation of $355.00 was sent to the Wellness Foundation which was diverted to pay rehabilitation services for a 14 year old stroke victim, Erica Francisco as a result of Sickle Cell Disease. This child is now doing well. The president extends her personal thank you, and together with the board of directors we wish to kindly thank all the supporters and sponsors for their generosity in making a difference in the lives of cancer patients, especially the children who are living and suffering from cancer. (Pray for them). The Belize Chemotherapy Organization of New York, Inc.
in Dangriga (BCC/D) former named Stann Creek was built, when it was open, and the donations provided by BCOONY over the past six years, starting with 2009 through 2016.
deaths not only of their people in Dangriga, but also of people in the country of Belize. care of persons including children who are stricken with some form of cancer. BCOONY president attended the opening of the center with a population of 10 patients, on the 1st day of October, 2008. In 2010, it recorded 947 patients visited the center. In 2011, patient’s visits projected to exceed 1,500 with 80% being oncology and 20% hematology, and other immune-suppressive diagnoses. The age range of children seen is 2 years to 18 years. them children and young adults. Center allows patients to access services in variety of ways. There were three hundred seventy-six registered cancer patients. Thirty-six were receiving chemotherapy, (29 adults and 7 children). per month for cancer care, and in 2010 there were twenty (20) cancer related deaths.